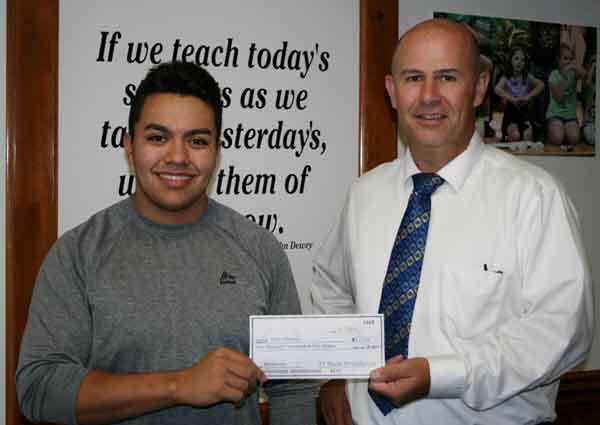 Federal Programs Director Steve Turner presented Adair County High School 2016 graduate Pablo Plancarte with a check Thursday afternoon for two scholarships—totaling $1,250—to help pay for Plancarte’s education at Lindsey Wilson College. Plancarte was one of 10 students in the state to earn a Kentucky Migrant Program Association scholarship, and the only recipient of the Kentucky Migrant Scholarship Fund award. Both scholarships carry prestige, as they require high ACT scores and grade point averages. Plancarte, a biology major at Lindsey, plans to become pharmacist. Pablo Plancarte was recently awarded two migrant scholarships for his outstanding scholastic achievement while a student in the Adair County School District. Plancarte, a 2016 graduate of ACHS, is pictured with Federal Programs Director Steve Turner.